A cold and unsettled weather pattern will move into the region, producing frost and freeze conditions, rain/snow mixes and waterspouts on the Great Lakes. An area of low pressure will dive south out of central Canada towards the Great Lakes before turning into eastern Canada. As this low passes by, it will drag a cold front through the region Thursday night, with northwesterly winds deepening the cold through the weekend. For Thursday, the weather will be pretty quiet. A fair amount of sun is likely early in the day, but clouds will thicken later as the cold front gets closer. Rain showers will hold off until after dark, but the chances for precipitation will not completely end until Sunday night. Precipitation from disturbances rotating around the parent low, lake effect and the breaks of sun destabilizing the atmosphere will all help produce on and off showers Friday, Saturday and Sunday. Meanwhile, cold air will continue to deepen across the Finger Lakes. While temperatures may approach 60 degrees on Thursday, highs will be in the mid 50s Friday, mid 40s Saturday and only low 40s on Sunday. By Saturday night and early Sunday, some of the rain may mix with snow over the higher elevations of the southern Finger Lakes and Southern Tier. 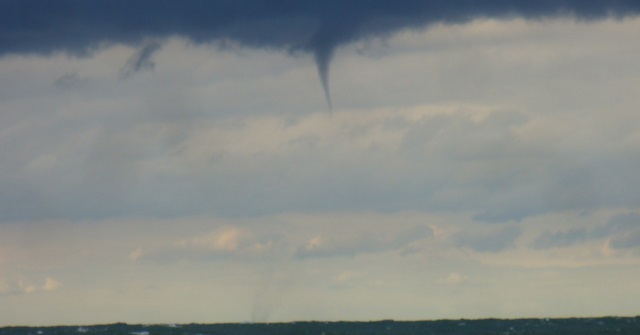 Waterspouts are also likely over the Great Lakes, thanks to the turbulent, cold air behind the front. This weekend will also mark the end of the growing season for the vast majority of our region. Low temperatures Sunday morning will be in the low 30s, but as high pressure builds in Sunday night, skies will clear and lead to even colder temperatures Monday morning. Only the warmest spots right along the Finger Lakes themselves will likely escape temperatures below 32 degrees.